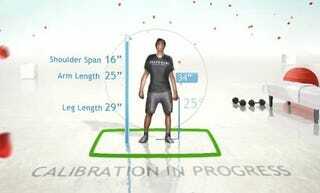 Your Shape's calibration measures things like shoulder span, arm length and leg length. When players are able to match movements with their trainer, they are "in rhythm". Players can also exercise with training like bicep curls. Your Shape allows players to create fitness challenges among friends. You know it, you love it, the hula hoop.